ere are many versions of Fish Head Curry in Singapore. Now a national standard anywhere in Singapore, many of the leading Indian Restaurant on Race Course Road have their own special way of preparing Fish Head Curry. This recipe in the video is from Chef Kumar from Muthu’s Curry (This Fish Head Curry is a traditional South Indian Curry Recipe). 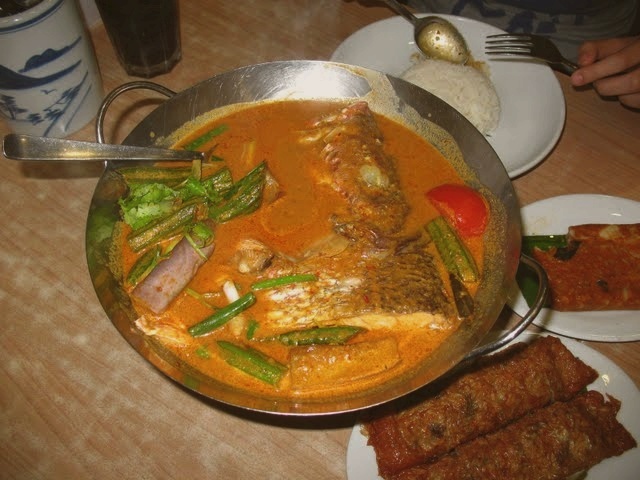 Other related recipe – Malaysian Style Fish Curry. Heat the pan and add 1/2 tsp cumin seeds, mustard seeds, fenugreek seeds, ginger, garlic, cinnamon stick, curry leaves, fry until the aroma comes out. Grind the fried ingredients with little water into paste. Heat the pan with oil and add chopped onion, tomato and fry until it gets golden brown. Add cumin powder, chili powder, turmeric powder, coriander powder fry until the aroma comes out and add ground paste. Let it boil and add salt and cleaned fish head. cook in the medium heat until the fish is cooked well. Add coconut milk and cook for 3 min in the simmer. Serve Fish Head Curry with rice immediately. Enjoy! curry power ka de maaa!